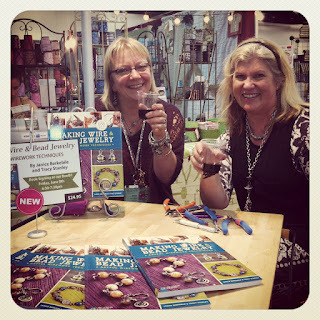 Beaducation: The Blog: Making Wire and Bead Jewelry - a must have book! Making Wire and Bead Jewelry - a must have book! It is so exciting to read a book written by your own friends and that’s just what I’m doing with “Making Wire and Bead Jewelry.” This wonderful book was written by designers Tracy Stanley and Janice Berkebile of Wired Arts. Not only are they friends of mine, but they are part of the Beaducation team of educators. These gals have been coiling, wrapping, weaving, and forging wire for years. Their national teaching experience has resulted in amazing designs with fine-tuned instruction. Tracy and Janice signing books at the Beaducation booth. The book starts with three introductory sections: Tools & Materials, Wire Techniques, and Finishing. The introduction to traditional and nontraditional tools provides a clear description and a picture of each. The authors stress the importance of quality which in the long run, will save you money and give a more professional “clean” look to your jewelry. I couldn’t agree more. If you are just getting started in wirework and aren’t sure if you will enjoy the craft, you may want to start out with less expensive tools. However, I would recommend getting the highest quality tools you can from the very beginning. In the Wire Techniques section, Janice and Tracy go over all the basic techniques with gentle and smart reminders to practice practice practice. They cover coiling, making jump rings, weaving, forging and spiraling, followed by making basic loops, wrapped loops and clasps. The photographs that accompany the instructions are detailed and provide the visuals you need. Are you a “Shiny Girl?” If not, the Finishing section provides instructions on oxidizing and polishing your wire pieces to give them a nice antiqued look. Now that you have learned all of the lingo and techniques, you can pick your projects. The thing that impresses me the most about this book is the number of projects. These gals have produced 24 projects with over 500 how-to photos (which they took themselves!). Most of them incorporate beads and other embellishments that allow you to really personalize your jewelry. Janice Berkebile and Tracy Stanley have taken basic and traditional wireworking techniques and made current, trendy and exciting jewelry. Each project includes tips and tricks and most have a “variation” photo showing you how to take the design further. My favorite project from Janice is “Acorn Caps.” I love weaving wire and this is a great way to showcase a focal bead. My favorite of Tracy’s is the “Wire-Wrapped Pendant.” The embellishment bead cluster flows so nicely in with the thick wire spiral and wrapped bead. The book concludes with a very inspirational photo gallery featuring work from the authors and seven other artists (myself included). I highly recommend this book as a great addition to any jewelry designer’s library. Beginners will learn a great foundation and intermediate and advanced wireworkers will learn techniques to take their work to the next level. Its so nice to know about them more. Hey Janeen you said it right.